SGL 207 is southwest of Wilkes Barre, between US 309 and I-81. I recently became interested in exploring this game lands, with its many ridges, rock outcrops, ponds, and wetlands. I parked off of US 309 near Mountaintop, at a game commission parking area at the end of Brown St. I then followed a gated railroad grade as it wrapped around the mountain above US 309; I believe this may become a rail trail in the future. The old grade cut through the bedrock. Below was Solomon Creek and the famed Ashley Planes which were inclined planes that brought coal up and out of the Wyoming Valley. The overgrown planes still exist today and were an engineering marvel of their time. At the second powerline, I turned left and then right, following another powerline swath. The terrain was quite hilly as I went up and over ridges. I was treated to some amazing views of Wilkes-Barre and I could see I-81 in the valley far below. Large rocks and ledges adorned the forests. I hiked around some wetlands embedded in between the ledges. The trail followed the powerline and soon brought me to the southern ridge, with some nice views to the south. 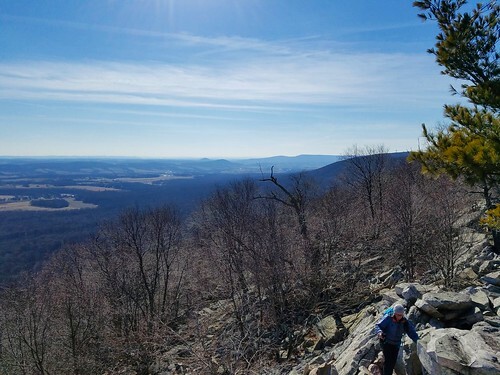 Here, I began my bushwhack, heading northeast along an exposed ridge with non-stop views over the forests and ponds below, walking around seasonal wetlands and ponds. I made my way back to the powerline and soon returned to the woods to a couple large boulders at the top of a ridge with some nice views. SGL 207 also features several meadows with grasses over bedrock and bare soil. I then retraced my steps to my car, passing several people hiking the old railroad grade. SGL 207 was worth visiting and has some of the best views of Wilkes Barre. I’d like to return to hike the rest of the old grade, although I doubt I’d hike the same route I did on this trip. I was recently in western Pennsylvania and decided to stop by two parks on the way home. 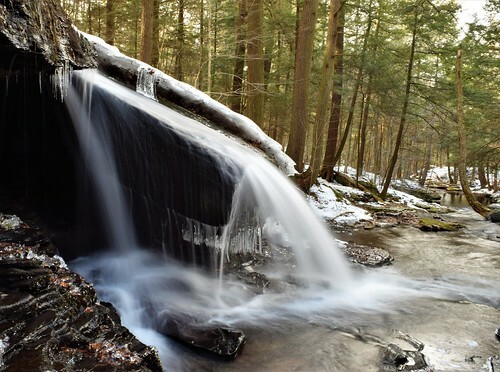 First was the Roaring Run Natural Area and Watershed, near Apollo, PA (not to be confused with the Roaring Run Natural Area in the Forbes State Forest of the Laurel Highlands). 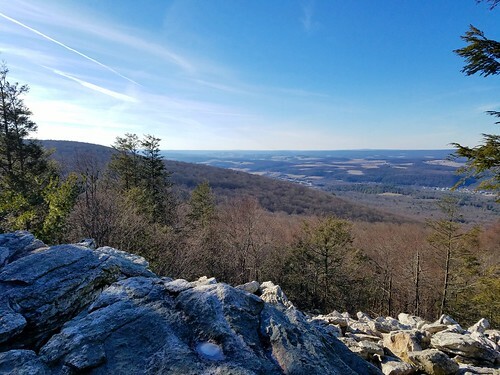 This preserve has several miles of hiking and mountain biking trails, not to mention a rail-trail. The trails lead to views, big boulders, a falls, and scenic streams. I hiked down the Rock Furnace Trail along Roaring Run. 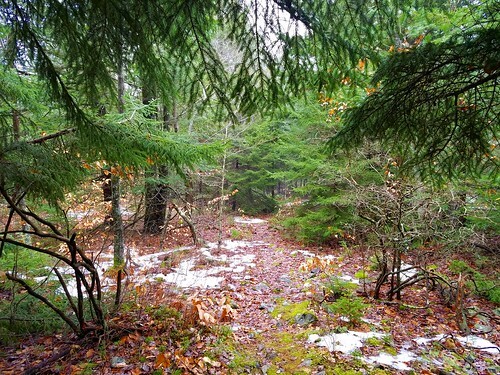 The trail was wide as it stayed above the creek, with hemlocks down below. Ledges draped with icicles rose over the creek as the sound of rapids filled the air. The fresh snow created a winter wonderland. There were also several large beech trees, and wild grapevines. The trail dropped down to the creek as Rattling Run joined; I had hoped to see the falls on Rattling Run, but it is private property. I continued down along Roaring Run, passing a small falls and large boulders. The creek is very scenic with its large boulders and pools. 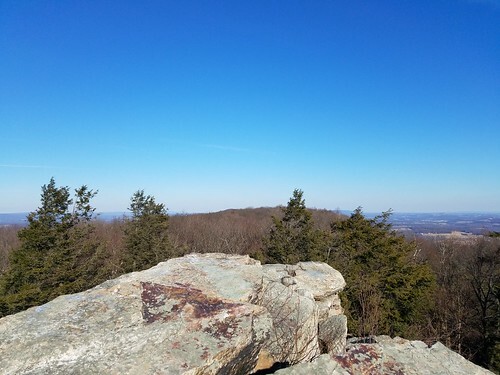 I reached Biddle and Camel Rocks, but could not see any signs of an old furnace. The rocks were massive, house-sized boulders. The trail crossed the creek over a suspension bridge and soon reached the rail trail at the large Kiskiminetas River. I turned around to enjoy the many huge tulip poplar, beech, and maple trees. 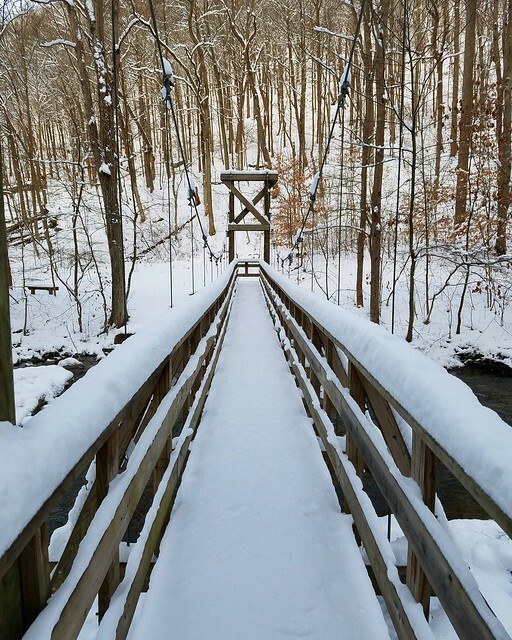 It is great to see many communities in western Pennsylvania embrace the outdoors with new trails, rail trails, and parks. I then drove an hour east to Buttermilk Falls Natural Area, a park belonging to Indiana County. Here, the snow was deeper and soft, again creating a gorgeous winter wonderland. The falls is about 46 feet tall, located in a small gorge. It was once owned by Mister Roger’s grandfather, and Mister Rogers spent a lot of time there as a child, and the experience would later help inspire his famous children’s program. Trails lead to the top of the falls, but I wanted to see the bottom. 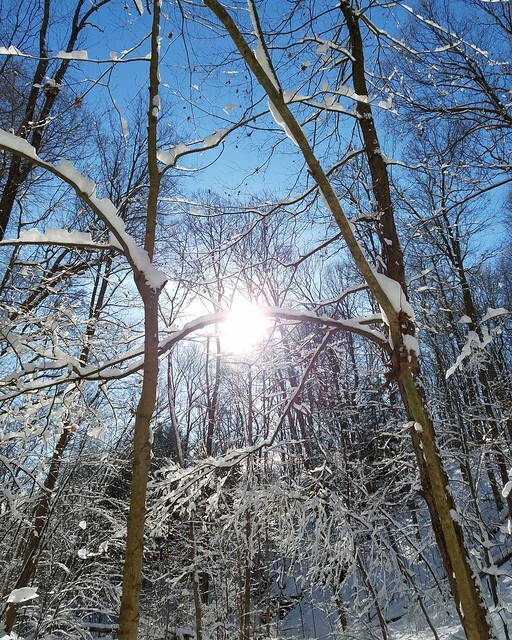 I couldn’t find a trail, so I meandered down to the creek, passing through and between snow covered boughs of fallen trees. 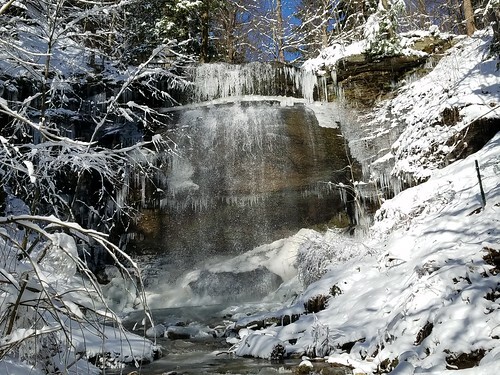 I made my way up the creek and to the falls as it shimmered in the bright sun with all its ice and snow. It was a beautiful sight. It is possible to hike behind this falls, but I did not. 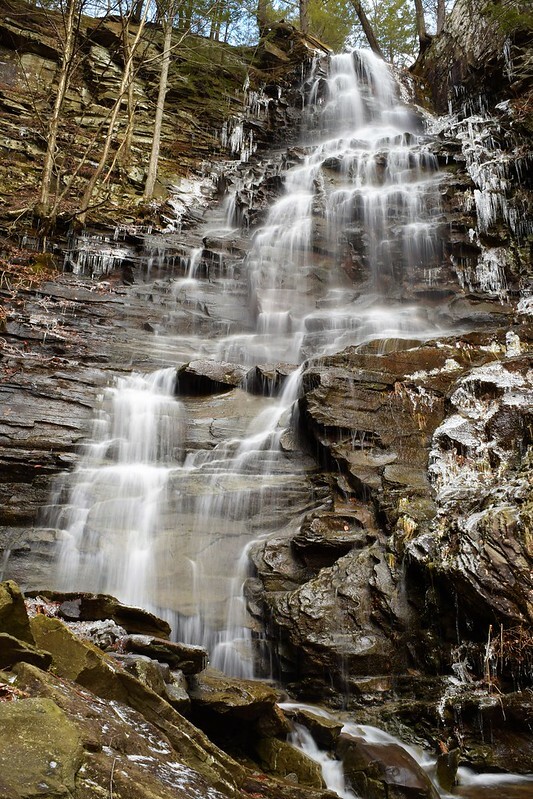 The water danced down the smooth face of the falls, fringed with icicles. I climbed out of the steep glen, trying to avoid sliding back down on the snow. Above the falls was an old basement ruin of the cottage that belonged to Mr. Roger’s grandfather, plus a small dam creating another falls. I returned to the car for the drive home. 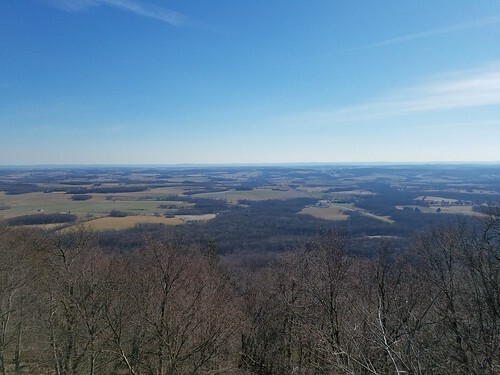 Western PA has many scenic spots just waiting to be explored, get out there and see them. I recently met up with Mike and Dani to do some hiking in the Loyalsock State Forest. The plan was to see Angel Falls and Ketchum Run Gorge with their waterworks. Brunnerdale Road was a fairly easy drive despite some packed snow and ice and we soon began our hike to Angel Falls along the Loyalsock Trail. It had been years since I hiked to the falls, and it was great to revisit. Angel Falls was one of the first hikes I did in the state forest many years ago and it made me realize how special this place was. The trail provided a steady climb and then crested the top of the plateau. We turned left on a blue side trail to the falls. I immediately saw all the huge tulip poplar trees growing above the falls, something I had not noticed before. Some were truly massive. Tulip poplars are the tallest of the eastern hardwoods, reaching 200 feet. In several decades these trees will be true giants like those at the Joyce Kilmer Memorial Forest near the Great Smoky Mountains; hopefully they will never be cut. We hiked to the top of the falls to enjoy the view and then walked to the bottom to see the cascading water in its splendor. Icicles framed the falls. Angels Falls is a beautiful place, cascading about 70 feet, with more waterfalls below. Cliffs surround the falls. Nearby, someone installed a rope swing from a tree with a view of the falls. Angel Falls flows most of the year, but is reduced to a trickle in Summer, and can dry completely during drought. After taking lots of pictures and enjoying the scenery, we hiked back to the car. Next we drove to High Knob Road and parked to hike down Ketchum Run, one of the state forest’s crown jewels. The trail had more snow than our hike to Angel Falls, and it was noticeably colder. We spoke to a few backpackers as they reached their car. 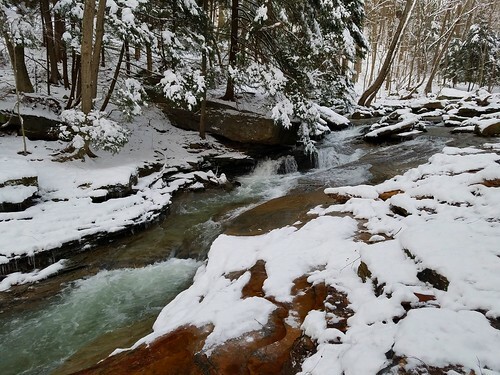 The creek had several small cascades and some hemlock forests as we walked on a ski trail. We went off trail and hiked along the creek to see its two beautiful off trail falls, including one that slid off an angled boulder. 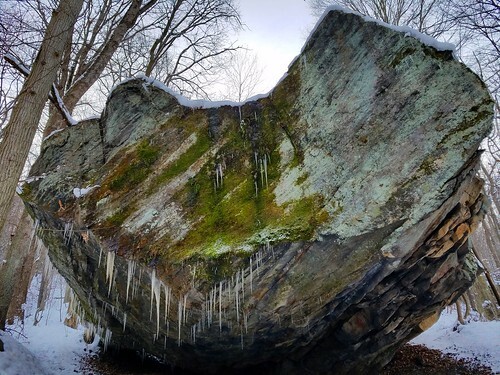 Snow covered the glen as ice draped the exposed rock. We continued down Ketchum Run, passing campsites, in the isolation and beauty of the gorge. We carefully hiked into the narrow gorge, but it was slow going with the ice and snow. This gorge is truly beautiful. Waterslides tumbled beneath us. We reached the top of Lee’s Falls, but decided to turn around due to the slick conditions and fading light. Back at the car, we decided to drive to High Knob Overlook to see the sunset as the light filtered through the passing clouds. We could see distant snow showers across the horizon. It was bitter cold but the view made up for it. A drive home in the dark followed. 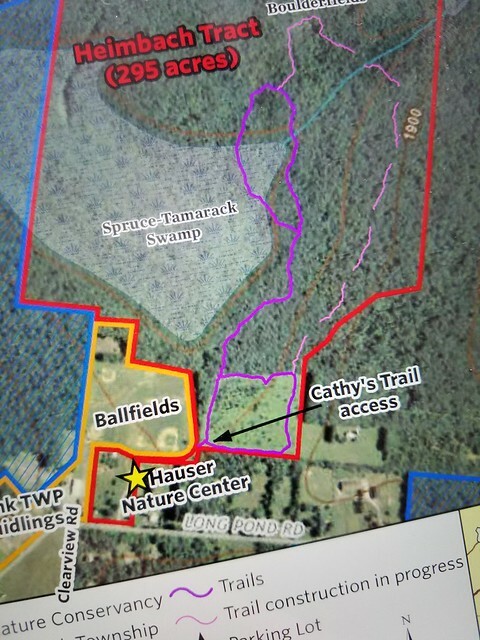 Over the last several years, vast areas of the Poconos have been set aside as preserves, many with trails. 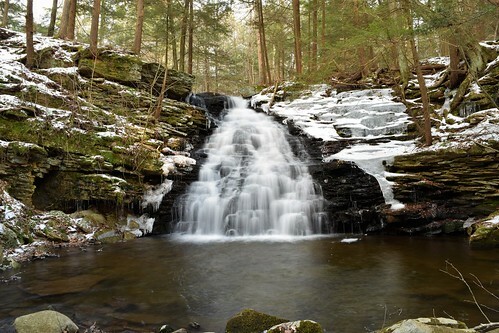 The Poconos are famous for its waterfalls and gorges, but its plateau is home to extensive wetlands and streams that harbor incredible diversity. 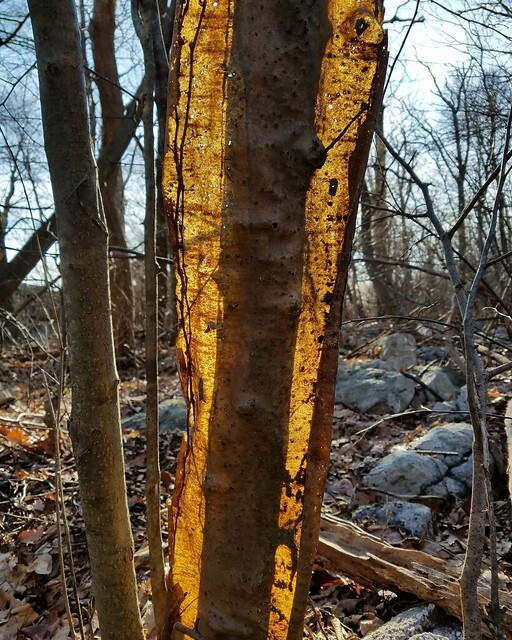 The Nature Conservancy has several parcels of land that make up the Long Pond Preserve. We traveled to hike Cathy‘s Trail, a short two mile loop. We parked at the Nature Conservancy visitor center, crossed a playing field to the right, and soon found the trail. 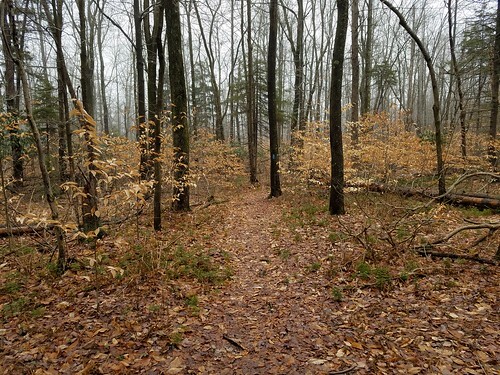 The trail is level as it explores scenic woodlands of maple, pine, spruce, and beech. Parts of the trail do get wet from a nearby swamp. We hiked near a small boulder field and returned through more open hardwood forests to a meadow, which we hiked around back to the car. Overall, this is a nice easy trail that is good for kids. I really enjoyed the deep spruce forests with the moss and ground pine. We could hear traffic from I-80. Next was a visit to the Long Pond Barrens. Parking off of PA 118 is non-existent. 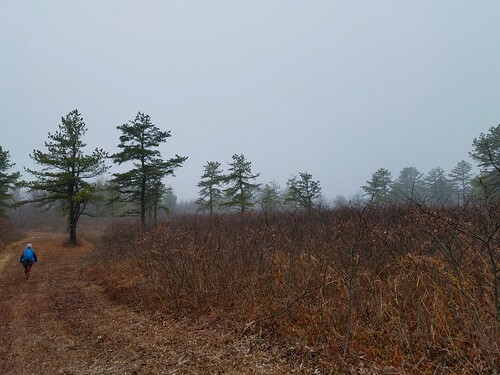 This preserve features an extensive selection of wide, mowed paths through fields of blueberry and stunted oak, with pitch pine. It is easy to hike a variety of loops. 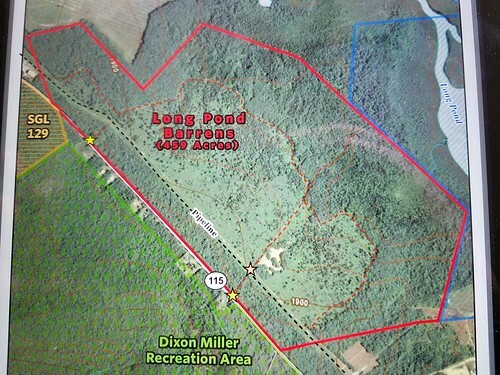 No trails are marked or signed, we navigated them using the Google earth map on our phone. Several areas are wet. It was a unique place with the pitch pine rising over the stunted forest and brush. While nice, it is not as scenic as the Eales Preserve. 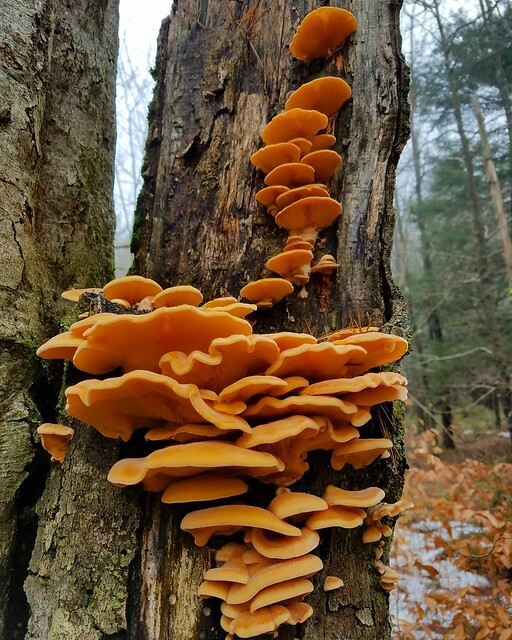 I think the best time to see this preserve is a sunny day after a snowfall, or during fall foliage season when the meadows explode with color. I hope to explore more of the Poconos.